I’ll be the first to admit that there are just some sports that I’d rather watch women play than men. One of them being basketball. 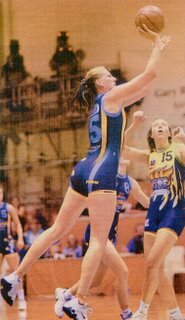 So you can just imagine my joy when the Wnba came to be. 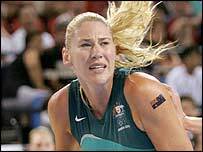 With that in mind, I make my first nomination for the vote of hottest ath-l-ete (said with three syllables): Lauren Jackson of the Seattle Storm. I have a few reasons to vote ms. jackson as the fittest athlete, none of which include that she is currently ranked as the 5th greatest player in the league, or the fact that she’s ranked as the best center in the league. Most of my reasoning is because she is 6’5″ tall. I being 6’4″ don’t find many women that are taller than me, and I think that it’s incredible to have a woman of her stature to look up to (literally). She is a perfect definition of an Amazon woman (ok well maybe not perfect, but good enough). Another reason that I think Ms. Jackson is the fittest athlete is because she looks good in form fitting outfits. I know you’re thinking that a lot of athletes can pull it off, but as indicated slightly to the left of these words…. she can really pull it off (and I doubt that anyone would mind if she did). Lastly, I feel that for any athlete to be nominated as the fittest, they need to have rockin hair. Some may (erroneously) feel that Ms. Jackson has plain drab hair. As you can see from this final picture, not only does she have cool hair, but she uses it as a weapon in her game. Steal the ball from her? She’ll whip your eyes out with that flowing mane. Going for a sweet 3-pointer? Not gonna make it with that distraction. She demonstrates fine male peacock abilities to attract attention, making her opponents lose their skills. anyways, long story made short Ms. Jackson = my first nomination.